The Karaka sales in New Zealand continue to be a happy hunting ground for the Cummings family. In 2014 Anthony Cummings crossed the Tasman in search of the next superstar of Australian Racing and returned with LOT 834. The yearling was a beautifully presented Road To Rock x Stylish Bel colt from Nearco Stud and after paying just $60,000 he commenced his racing career as MONTAIGNE under the watchful eye of Anthony and Edward Cummings. It didn’t take long for the flashy son of Road To Rock to showcase his talent and in his first racing preparation as a 3YO he put two wins together starting with a city maiden followed by a BM85 at Randwick. Coming back in trip saw this budding star run 3rd in the Hobartville Stakes, 5th in the Randwick Guineas and 2nd behind Victorian Derby winner Tarzino in the Gr1 Rosehill Guineas, showing class that day to beat home the 2016 Caulfield Cup winner Jameka. He went on to finish a closing 4th in the Gr1 BMW behind Preferment before the interest from Hong Kong quickly picked up. MONTAIGNE was sold for a staggering $2,200,000 and entered the John Moore yard as BEAUTY GENERATION. He has grown into the horse we hoped he would and has now won 3 Gr1’s including the Hong Kong Mile, Silver Jubilee and more recently the Champions Mile under the urgings of Australia’s Zac Purton. 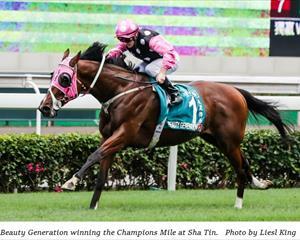 BEAUTY GENERATION look set to become Hong Kong’s Horse of the Year, a great credential for the Cummings Racing team and everyone involved with his career progression. Cummings Racing continues to find the very best of international racing when attending the Yearling sales and with continued success from horses such as BEAUTY GENERATION you cannot overlook the purchases made by the team in 2018.